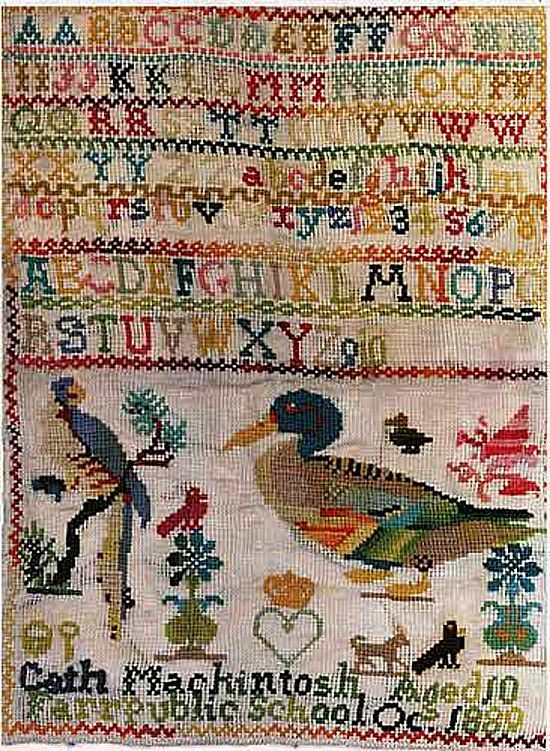 This rather colourful tapestry sampler was (as can be seen at the foot of the picture) the work of Catharine MacKintosh, aged 10, Farr Public School, October 1879. The original tapestry itself - viewed at close quarters - is incredibly intricate in detail and must have involved an immense amount of time and effort (no doubt under the watchful eye of a very diligent and strict schoolmaster). Catharine was born and raised at Milton of Tordarroch, Farr and belonged to a very old and distinguished line of the local Mackintoshes. She may well have had a choice of attending either Farr School or Bunachton School which was closer to where she lived(Bunachton School has long since closed and is now a ruin standing on the bleak and windswept Drumashie Moor). Her future husband John (Jock) Forbes (1867-1955) was born and raised in Bunachton and would have attended Bunachton School at a time when there was 16 households living in that particular township (for a time - in the recent past - there was only one permanent resident). Both Catharine and Jock lived their entire lives in the Farr area and would have witnessed enormous cultural and technological changes over their long lifetimes. Catharine and Jock were native Gaelic speakers but (as was so often the habit at that time in the Highlands) they did not pass their native tongue on to their children as they thought it would "hold them back" in their careers. They would also regard their Gaelic language as a device for discussing private matters without their offspring knowing what they were talking about. Little did they know that - while their children would not speak the Gaelic language - they would understand EVERY word supposedly spoken in private by their parents!